The currency market is doing the right thing by giving us a big currency depreciation. RBI is doing the right thing by not coming in the way. There are major mistakes on financial policy that are preventing firms from hedging against currency fluctuations. The graph alongside shows the time-series of annualised rupee volatility. We started out from 1998 with a volatility of 1.84% per year. This is roughly the same as the Renminbi's volatility in the 2000s. This lasted for 4.74 years and ran into trouble when RBI ran out of bonds for sterilisation. There was a great deal of confusion and turmoil, and volatility doubled to 3.87% per year on 23 May 2003. This lasted for 3.84 years. Once again, there was a great deal of confusion and turmoil, and on 23 March 2007, volatility doubled again to 8.5% per year. Each of these changes were wrenching episodes where people were used to low volatility, and all of a sudden (with zero transparency), volatility doubled. This pain is now behind us. From 23 March 2007, we have arrived at a market rate. We are used to debates about getting away from administered prices for petrol or fertiliser. 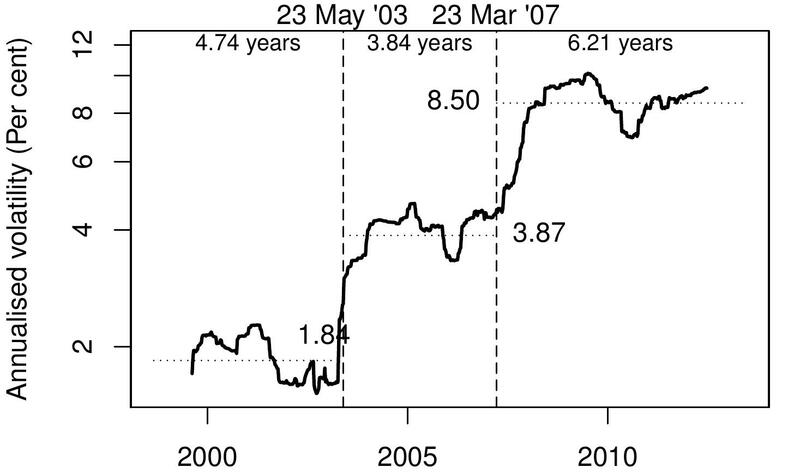 The biggest achievement of the UPA in economic liberalisation is this switch to a market rate, on 23 March 2007, for the most important price of the economy. As with cement or steel, market pricing has been a durable framework. It has already lasted 6.21 years, which is more than the previous two periods. A government can distort the exchange rate for some time, but the difficulties that this causes are large, and over time it will generally have to let go. Stability requires floating. After 2007, the floating exchange rate worked well in stabilisation. When times were good, a lot of money came into India, and the rupee appreciated. Rupee appreciation cools the economy, as the profit margins of companies that make tradeables goes down. When times were bad -- e.g. after 2008 -- the rupee depreciated, which propped up the economy by driving up the profitability of all tradeables firms. Indeed, in a country where neither fiscal policy nor monetary policy do stabilisation, the floating exchange rate is our only source of stabilisation. Even if currency trading by RBI to influence the exchange rate were desirable, this is increasingly infeasible. The global market for the rupee now does turnover of $70 billion a day. To make a significant dent in the price, RBI would need to trade atleast $3 billion to $7 billion per day. These are large numbers which would quickly exhaust reserves or distort reserve money. The RBI needs to be more honest in saying that other than doomsday scenarios, they are out of the currency market. The real lever through which RBI can influence the currency is the interest rate. When RBI raises rates, more capital comes into India. Over the years, currency trading has become ineffective, but over the years, the interest rate channel is becoming more potent. To the extent that a big currency depreciation triggers off inflation through higher prices of tradeables, this is a reason for RBI to raise rates in response. The strategy of allowing the market to set the exchange rate is a sensible one, other than in one respect: currency hedging. In the old world, RBI produced one big umbrella for the entire country, by fixing the exchange rate. Firms could go about their business without needing to think about the possibility of exchange rate fluctuations. RBI is now out of this business, and the firms are out in the rain. Each firm now needs to go out and buy its own little umbrella that protects it from the rain. The trouble is, the present framework of financial policy is hostile to the emergence of currency derivatives markets through which firms can do this hedging. This is a big mistake. It is entirely sensible for RBI and the government to stop producing one big umbrella that covers the entire country -- but they must simultaneously get out of the way and allow the production of a diverse array of small umbrellas that fit one firm at a time.